Britons are more - not less - likely to be the target of terrorist attacks as a result of the war in Iraq, an influential group of MPs claims. The Foreign Affairs Committee says British interests are under threat in the short term because of the conflict. It also claims a failure to find weapons of mass destruction has "damaged the credibility" of the US and UK's war against terrorism. There was a "crisis of confidence" in the security services, one MP said. The committee, tasked with looking into the foreign policy aspects of the war against terrorism, took evidence from a range of experts and politicians, including Foreign Secretary Jack Straw. 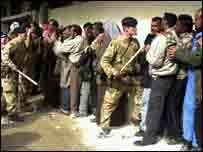 It welcomed the capture of Saddam Hussein following last year's war. But it argued: "The continued failure of the coalition to find WMD in Iraq has damaged the credibility of the US and UK in their conduct of the war against terrorism." Labour committee member Andrew Mackinlay told a press launch of the report: "There is clearly a crisis in confidence now ... about the competence of our security services and the analysis which is given to raw intelligence. "Behind everybody's minds is whether or not there has been or could be disproportionate status given to some intelligence, particularly single source intelligence." Mr Mackinlay, said an independent inquiry "could not be avoided" and insisted many people were concerned "about our failure to find WMD". He said it was a "great deficiency in our democratic process" that there was no parliamentary oversight of the security and intelligence services in the UK. Tory member Sir John Stanley said there would be a "much greater level of scepticism" about intelligence that suggested there was a further threat from WMD as it now seemed "improbable" any would be found. The MPs also outlined their concern that "that the war in Iraq has possibly made terrorist attacks against British nationals and British interests more likely in the short term". While a successful handover of power to the Iraqis would lessen the terrorist threat, they warned against any scaling back of coalition forces until the Iraqis were able to ensure security themselves. The MPs said those who had predicted destabilisation and the growth of extremism in the Middle East following the war "have not been proved correct". They expressed "regret" over the refusal of other major powers such as France, Russia and Germany - all opponents of the war - to send forces to help stabilise the situation. Both British and American governments were to blame for their "insufficient anticipation" of the scale of the security problems they faced in Iraq after the war, the MPs said. They claim it was "unfortunate and regrettable" that a lack of law and order, and interruptions in essential services, "had resulted in a loss of goodwill among those worst affected", although important progress was being made. The MPs urged the UK and its partners to "scale down their armed forces" in Iraq, but conceded that British troops and civilians were likely to be needed to stay in the region "for sometime to come, possibly for several years". The report comes as Tony Blair is under increasing pressure to instigate an independent inquiry into the quality of information used to justify Britain's role in the Iraq war. Downing Street said it would "shortly" say how it plans to address the failure to find any WMD in Iraq. Should the UK hold an inquiry into WMD?